In commercial property, as in all else, amid digitisation, the dynamics of the market are changing very quickly, and are about to accelerate yet more so. To address this conundrum, our award-winning design abilities included, in the emerging world, Shiro Architects can help you find, adapt to and win more of the customers you really want. The technologies of this age will transform forever the relationships between those who own and invest in properties, and those who buy, lease and use them. We can help you take advantage of the data-driven revolution to deliver to occupants the best-fitting buildings by engaging more of the connected intelligence, experience and insights of those who will use them in their design. Once upon a time, there was no such thing as pervasive social internet literacy of the sort that now exists in the Facebook age of social media. That meant that up until now, there was no single ready and accessible body of connected occupiers, knowledge, first-hand experience and opinion that could reliably be applied to help investors determine and provide the best-fitting building for any identified single group of users. As our own research into workplace strategy uncovered, one consequence was that even some of the most sophisticated and well-resourced, ASX-listed, CBD commercial property providers didn’t really know how their tenants were using their spaces. Despite having potential daily proximity to those users’ minds, they had acquired little of the qualitative user marketing data typically available to those formulating products and services in other industries, and they certainly didn’t have it to hand in real time. This was not only a lost opportunity, it also likely came with a business cost. When lacking reliable user-centric data, investment, refurbishment and fitout decisions could only be made on less than the best available information. Premises would likely therefore not be optimised in step with the needs of those who actually paid to occupy them. Money might also be wasted or spent on things that, location aside, built neither affinity, desire, profitability nor loyalty among those properties’ users. And shareholders could have little hope that those managing their property investments would consistently get a better competitive return, based on building a better, evolving understanding of their customers or users. Through the ever-closer connectedness now possible online between providers and occupiers, the changes now coming offer unprecedented ways of seeing better inside the minds of your buildings’ users, to realise an unfolding opportunity that is big, networked and now unavoidable. Using the new knowledge it affords, we can also help you understand those customers’ needs so you can make appropriately calibrated investment decisions about the facilities you offer them. Through this, we can help you achieve better portfolio balance, enhanced user data and customer relationships and safer returns. For some, the change coming will prove disruptive, but as an industry, just as in others, we’re going to become increasingly reliant on the efficiencies that come from investing in the growth of such inevitable user-driven science. And against this, the product of our unique study, research and work, we can apply thinking and skills that will likely for the foreseeable be unique, or, at least, certainly hard to replicate elsewhere among those against which we may be perceived to compete. We are now entering an entirely digital economy that presents significant new challenges to those in long-established property categories. For one, much of its commercial office demand will be reduced through companies taking ever less space, fuelled by falling office headcounts driven by advances in machine learning and artificial intelligence (AI). Second, as our own research attests, the smarter those already taking space get about buying it, the less of it they tend to take. In whatever way they do it, the business models of those providing that space must adapt to these realities. In this era, the now-pervasive social internet literacy Facebook-era social technologies have created offers a new, untapped and fully formed management resource with unprecedented power to change the work of property owners forever. The ease with which two billion people use Facebook has created an interested, opinionated class of property users whose knowledge is ready to be engaged in advancing the creativity and inventiveness any property-concerned business can employ in capturing data-driven, competitive property gain. We describe this wholly connected world as the Learning Economy and, being especially interested in the ways in which organisations learn, as founders of The Learning Economy web site, we’ve written there about the likely learning needs and interests of diverse property-interested groups, from the tenants leasing a single CBD office to those creating large investment portfolios of workplaces and dwellings. Not least to its own investors, each needs to assert its place and its capacity to learn anew in this data-driven revolution. Ubiquitous internet social literacy now affords relative ease of data capture in understanding the real needs of a building’s tenants and users. Collectively, their minds represent a development’s “knowledge community,” and because users probably have a closer relationship with the properties they occupy than with any other product, whether at work or at home, they will be able to express opinions about them that those who provide those facilities cannot know but need to hear. And to seize those insights, it is now possible to apply to the task of property portfolio optimisation the best private social technologies ever invented for capturing and disseminating knowledge across a business. New ways of understanding customers’ and users’ real-time built space needs can now help smarter property providers understand how to develop superior products, services and experiences and to capture greater, lasting value by meeting and monitoring better their targets’ unique and evolving accommodation requirements. And as investors’ decisions at all levels will increasingly be based on data, mastering user-driven pattern-based thinking will help today’s smarter providers get ahead. This will play out throughout the established value chain of property delivery, from imagination and concept creation to services delivering post-occupation “concierging” and customer care. And those in the Learning Economy that manage to do this best will also reduce the cost of unwelcome uncertainty in their business, and send a powerful, positive message to new investors. We believe the need for superior customer satisfaction will never change, and the better the understanding of their needs is built into property managers’ thinking about the value they offer in their customers’ eyes, the better the likely fit of a building to its users’ interests will be. 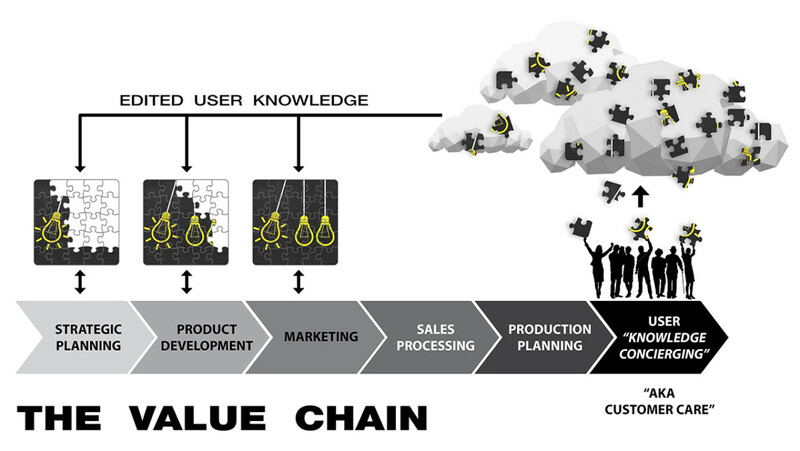 Moreover, the better will be the shared knowledge, data relationship and learned trust between supplier and customer. Reputationally, when a product better fits requirement and the supplier intends to ensure it continues to do so, customers are likely to become loyal, pay a premium, stay longer and tell others about it. By proving in their own words that we can get your customers the buildings they need, Shiro Architects can help you make better investment decisions and reduce risk across your portfolio. So, in the long journey of the property relationship, we don’t just design award-winning, advanced commercial spaces to feel good about. We will get better insights, and our skills will ensure that those who use those built spaces will value them. And, working with you, we can introduce into your thinking new opportunities across your entire value chain. Prior to founding Shiro, our design principal Hiromi Lauren enjoyed a highly successful 20-year career working for Harry Seidler and Associates, where she was an associate, and one of Harry’s favourites. Then, her first building completed subsequently in her own right, the KDV Golf and Tennis Academy on Queensland’s Gold Coast, scored her and Shiro “a hole in one” when, in June 2017, it won the 2017 Queensland state award for commercial architecture. In its January-February 2018 edition, Architecture Australia magazine gave it generous coverage, and you can download a copy of that feature article here. Post its award, Hiromi’s first media interview, was also published here in the Australian Design Review. But, when working for Harry Seidler, Hiromi had already proven her ability to create unexpected financial benefits for developers. In short, we can marry superior building design quality with vastly improved user data that over time can change the ways your business relates to and strengthens its bonds with its customers. Hiromi’s design can sometimes deliver striking and unexpected financial gains for clients, and in this we can prove our claims. 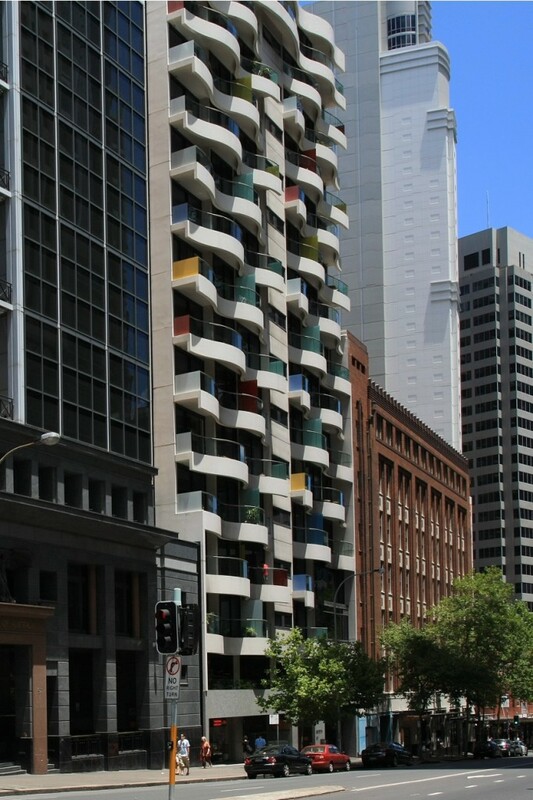 When working at Seidler’s, Hiromi earnt Harry’s esteem by securing his developer client an unexpected windfall of more than $5 million when she designed an unexpected extra unit into each of 11 of its 16 floors of the North Apartments building in Sydney’s Goulburn Street. We create high-functioning showcase commercial and residential projects, taking the forward-looking, innovative character of modern, minimal Japanese architecture as inspiration. Its striking appearance aside, this was also a notably inexpensive building, built on time and to budget. We are now working for our client, KDV Sport, on its follow-up project, its student accommodation block, designed to house top-flight international sporting students in an environment that simply must also follow this same “feel good” rule. But as digitisation is transforming the entire landscape in which we exist, we have confidence that the knowledge of users it makes available as further briefing inspiration will enable us further to design yet more optimal new places in which to live and work. Addressing every consideration in design, knowledge architecture examines feasibility and is a high-grade briefing tool, good for testing and getting into the detail of users’ actual needs to manage risk. Knowledge architecture opens up new choices, and if you own, develop, invest in or manage real estate, we’d be extremely surprised if at all points you didn’t want to extract its maximum possible value at the lowest cost. To do this, you don’t have to have any plans to build. You just have to be curious about what you need to know to get a better return on what you already own, or may decide to invest in next. Alternatively, as the Learning Economy becomes ever more of a reality, you may simply wish to know how to get better use of your workspace to scale back space usage while accommodating in increasing comfort more of the creative, higher level functions of your organisation’s work. Contact Graham Lauren to find out more, on 0416 171724, or at graham@shiroarchitects.com. Or as a first step, read more here about it, at Knowledge Architecture. 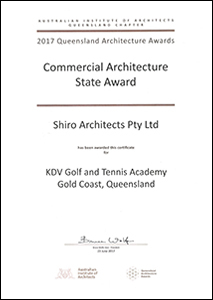 On Friday, June 23, 2017, in Brisbane, Hiromi Lauren was awarded the 2017 Queensland state Institute of Architects award for commercial architecture for the Gold Coast KDV Golf and Tennis Academy, her first building in her own right. Here is a pic of the award. This is a really big tick for her, and for Shiro. “When building the Meriton Tower, he worked with one of his gifted designers; Hiromi Lauren, who now runs Shiro Architects. 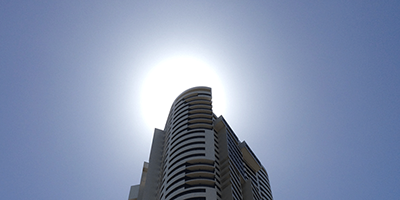 Her ability to adapt her designs at speed were exactly what Seidler needed for the ever-changing project." For us, this is generous acknowledgement indeed. If your interest lies in optimising your payback on commercial property, the best-fitting premises, and therefore, most likely the best investment, will generally be one that accords most closely with positive user feeling, comfort, utility and experience. Understanding and satisfying that user community’s interests is therefore a big deal, and if you want customer loyalty, nothing works better than finding out what those users really want and care about. In an age of increasingly pervasive collaborative internet social literacy, the internet provides the best tools ever invented for getting this feedback, in real time, and we have a unique perspective and methodology to make this work for your business to deliver a more dependable return on assets.